The cutting-edge techniques detailed here include those that are particularly popular in multidisciplinary neuroscience research. There are readily reproducible methods for establishing neural cell cultures, measuring enzymes and their inhibitors, and using quantitative autoradiography to study monoamine uptake sites and receptors in the brain. Additional methods cover the use of flow cytometry to study developmental neurobiology, applications of magnetic resonance spectroscopy (MRS) to human brain metabolism, and the study of drug metabolism. 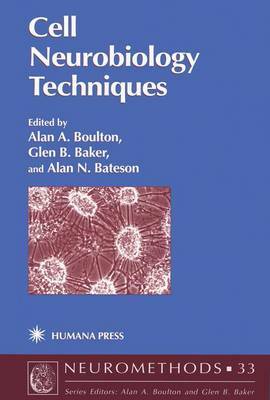 Together with its companion volumes, In Vivo Neuromethods and In Vitro Neurochemical Techniques, all three cutting-edge works will prove exceptionally useful to those basic and clinical neuroscientists who want to expand the range of their current research or develop competence in complementary methods.